We saw thousands of great innovations and groundbreaking prototypes at CES this year. Let’s take a look at some of the areas of technology that will impact businesses the most. 8K TVs were ubiquitous at CES this year. It was Samsung’s 75-inch Micro LED 4K TV (I know, not 8K) that was the real show-stopper. This TV is a game-changer in that it’s modular—meaning that you can customize the size and placement of the display by adding or removing Micro LED panels. This technology won’t come off as a necessity to the average Joe, but the possibilities are promising. On top of this, the Micro LED technology combines the benefits of OLED and LED and replace OLED altogether in the near future. LG’s OLED TV R was another fan-favorite because of its 65-inch rollable 4K HDR display. It has both aesthetic and practical uses. First, it is a large screen that can be easily put away when not in use. Moreover, the TV is also equipped with built-in Dolby Atmos speakers, an array of smart features like Amazon Alexa and Google Assistant, and connects over Wi-Fi. Not bad for something that can be rolled up like a sheet of butcher paper. Displays have become larger, brighter, and clearer, but we’ll soon see the added benefit of flexibility in homes and businesses. 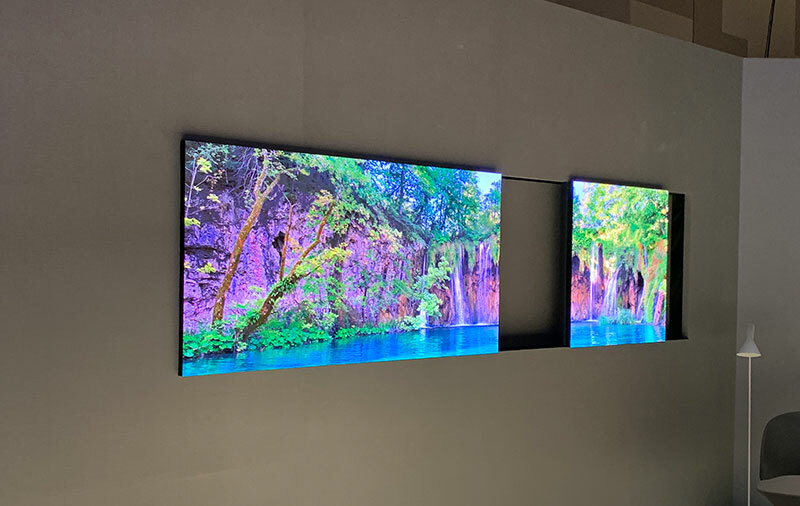 Because of the clean, bezel-less look as well as the ease of moving it around, businesses can also use this television for Modular panels allow a lot of freedom and customization with different screen sizes and display positions. For businesses especially, this can prove to be useful for saving space or presenting different type of media. Because of the clean, bezel-less look as well as the ease of moving it around, businesses can also use this television for multiple purposes, such as retail, hospitality, and conference meetings. Most importantly, this TV can save a lot of space for those who don’t want a giant, black screen omnipresent in the room. When it comes to everyday activities like conducting a business conference call or playing an online game, Internet connection is crucial. Even with our current 4G network, we see some packet loss, high latency, and slow download speeds. However, the jump from 4G to 5G not only improves throughput. A 5G connection is smarter, too. 5G uses high frequencies between 30 and 300 GHz compared to the 6 GHz and less the 4G uses. From a maximum speed point of view, 5G is around 20 times faster than 4G, which means downloading a single HD film can take less than a second. Not only will it drastically increase data speeds, but it will also create more stability due to high frequencies being so directional. The MIT Technology Review called 5G a “technological paradigm shift” because it will impact the smart technology ecosystem as a whole. Industries that entail any sort of data processing, particularly automotive, software, healthcare, and IoT will feel the huge impact of the amount of data that can be processed and integrated with 5G. More data means smarter cars, groundbreaking predictive care in healthcare, smarter AI, and more in-depth analyses across industries. To simplify, it won’t be just another network, but dramatic change in global economies as a whole. From a business standpoint, 5G provides great connectivity and fast data processing first and foremost. These are crucial for enterprise and SMB networks: both rely on speed, efficiency, and security. Since businesses are gradually moving toward using cloud as opposed to obsolete hard drives, 5G will greatly enhance businesses’ mobility and flexibility. Also, more Internet of Things (IoT) devices can come to fruition due to the massive data processing capabilities of 5G. You won’t have to sacrifice a smarter thermometer or smart security system for fear of network bottleneck. For the past few years, AR and VR technology has headed in a promising direction, and advancements in 2018 didn’t disappoint. Previous denominations of VR headsets and AR glasses were expensive, bulky, or not practical. 2018 welcomed stylish AR-enhanced sunglasses to large displays that provides a “simulated reality” without the need of any glasses. The one application of AR that seemed to tower over the rest was Google’s Augmented Reality Microscope for Real-time Automated Detection of Cancer, or ARM for short. This microscope combines deep learning and augmented reality by creating a real-time image analysis of the cell. The ARM can detect various defective cells or tumors using cancer detection algorithms embedded within the microscope. Most importantly, this microscope will be affordable and fits existing microscopes, which makes the technology accessible across the planet. There’s another level of reality to this world—simulated reality. We traditionally needed another device to help us connect with the virtual or augmented reality, but this level removed that requisite. Combining eye tracking, gesture recognition, and hand tracking technologies into one display allows you to interact with the augmented reality without glasses. For businesses especially, this removes the added costs of headset and glasses and creates a more realistic environment. During last week’s, the Dimenco Simulated Reality was introduced which conveniently achieved the simulated reality. Watching 3D in the theaters was pretty amazing by itself already, but now we’re getting closer to a commercially available display system that lets you do cool AR activities without the need of glasses. Last but not least, we’re getting closer to a pair of glasses that one would probably wear thanks to the Chinese startup, Nreal. Its main selling points are comfort and low-profile design that pretty much looks like any other sunglasses. Don’t be fooled though—these glasses are fitted with high quality 1080p laser projectors for each eye and offers a 52-degree field of view. This already beats out the other competitors like Microsoft Hololens and Magic Leap One, but the Nreal glasses also weigh less. You can enjoy light entertainment by watching videos and everyday productivity features, but it’s also possible to make telepresence calls for important business meetings. Skip the cumbersome steps of booking a room and making sure the cables are plugged in—you can simply wear the glasses and conduct a meeting. 2018 shook the transportation industry more with electric vehicles, tunnels, and drones. Future history books will mark December 18, 2018 as a watershed moment for the transportation industry with The Boring Company’s first opening of the Boring Test Tunnel in Hawthorne, CA near Los Angeles. The one-mile high-speed loop tunnel had some bumps here and there, but it did prove that digging tunnels can definitely be another option for cities looking to find solutions for traffic in 2019. The aforementioned onset of 5G technology also impacts the auto industry in large strides because of the increased data speed. Smart cars rely heavily on data due to cameras, radars, sonars, GPS system, and more, so the ability to process this data and send it to the central cloud will prove to be a big turning point for auto companies. Smart cars are inching closer to the fully automated status that we all one day want to achieve. Automated transportation is big news for shipping and logistics. Many felt like 2018 was the year that the drone delivery services might have gone live, and all eyes were on Amazon’s Jeff Bezos to see if he could pull it off. But the onset of federal regulations, privacy and security concerns, and other issues considerably slowed implementation. The UK in early 2018 overhauled its drone legislation and the National Air Traffic Control Service (NATS) and allowed drone deliveries in select areas. If this legislative pattern continued to other parts of the world, especially the US, drone delivery can start becoming mainstream in the near future.